This is Lovey, now his name is Lennox. He is an American bulldog, boxer,pitbul mix He was adopted after being rescued from "deathrow" at the pound in Miami by Fur Angels Rescue. Lennox was fostered for a while and suffered the abandonment of his family that dumped him at the pound and then the moving from foster to foster until adopted. 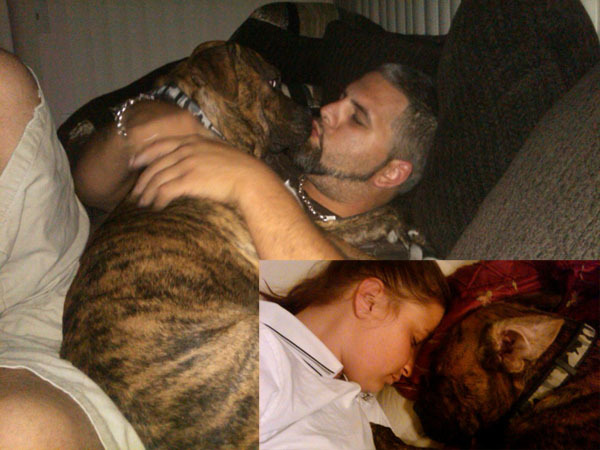 Now he lives with Kelly and her family, they gave him a "furever home" and they adore him . He is the happiest dog in Key West. My husband and I were driving in one of the main roads in Punta Cana, Dominican Republic to go get gas; there are very few gas stations there so we took a different road searching for one. In these countries is common to see abandoned dogs roaming the streets, I've seen a lot of them as we drive around the area and my heart gets like a "prune" every time. I guess they manage to get some food from the little stores around or maybe the people that own them let them roam the streets. I was looking out the window on this narrow 2 way road and I see this emaciated dog with terrible mange at the side of the road, then I see a man throwing stones at her. Apparently the dog had approached him to beg for food and he was trying to scare her away throwing stones! I was so upset that I started to cry but my husband could not stop since he was in a hurry to get to a rehearsal. I could not sleep that night thinking about that poor angel suffering there in the terrible hot sun with no food or water. That road is very dark and dangerous at night so I could not go back there alone. I got up in the morning and drove to the place that I had seen the dog but could not find her, so I turned around and went back about a block from there she was! At first I thought that she was dead, she was lying motionless and since it is a very busy and dangerous road I thought that maybe she had been hit by a car. It was a terribly hot day and the road had no sidewalks or houses around, so she was lying on hot stones. I approached her slowly and she lifted up her head and although she was so frail she managed to wag her tail. I started to caress her and she licked my hand so I offered her some food and water. She ate it desperately and when she was done she started to eat also some of the white pebbles from the floor where scrapes of the chicken had fallen. 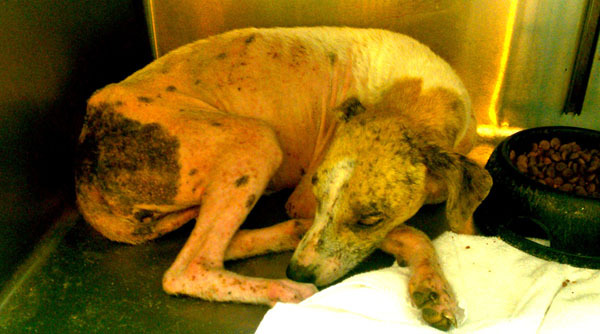 I could not believe the condition of this poor angel! I had taken a towel to wrap her in case she would bite me out of fear when I got her in the car. Finally I drove away with her in the back seat and started to look for a veterinary clinic which it's hard to find in Punta Cana. This is mainly a "hotel and resorts townâ€� and the rest is still an undeveloped area, the first shopping center was built about 4 years ago. Finally asking around I found a vet, a clinic belonging to Julie Giraldez and her mom, also a vet, that would care of her. Getting the dog out of the car was an "ordeal". The vet's helper came get her out of the car and when he tried to carry her from the back seat, she ran away down the street terrorized. A of bunch of natives that were watching the situation started to run after her trying to help us catch her, but she got even more terrorized since on of the guys was in a motorcycle and another one with a broom. It became a circus with all these people chasing her and others watching the scene but I was determined to catch he, she just could not get lost around that area that she was not familiar with and I was leaving in a few hours back to Miami for a week. So I brought a leash from the vet's office and the helper brought some heavy leather gloves to catch her, we cornered her and we finally got her. She would have to stay at the vet's office until I got back and until I found a home for her. She was diagnosed with Demodex mange, parasites, anemia and malnutrition, the poor baby looked like the skeleton of a dog. She was so exhausted after the vet gave her a bath and shots that she fell asleep; it sure was nice to have a safe cool place with food and water to be able to rest. She was just so happy to be inside, even if it was in a cage at the vets, that it was hard to get her out the door to walk her, she was afraid that she would be abandoned again. I named her Libertad (Spanish for freedom) "Libby" for short. I was trying desperately to find a foster home while I was gone for another week but I did not know many people outside the hotel. A foster or a permanent home seemed to be a very hard thing to find, so still she had to stay at the vet's office inside a cage, something that I totally dislike. I think that animals have karma too, the last week before I had to leave Punta Cana, I found a wonderful Cuban man, Marcial Urra, that lives in town. 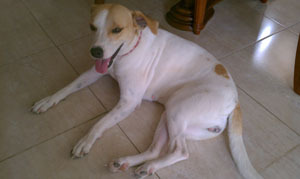 I had told him her story and he showed interest to go see her at the vetâ€™s office. When we arrived Libby gave him kisses through the kennel bars so he fell in love and told me that he wanted to adopt her! 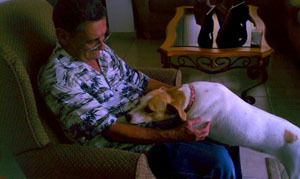 He lived alone as his family is still in Cuba, so this sweet angel would be his loyal companion. I went to Libbyâ€™s new home and it was such a joy to see her so happy and healthy as she greeted me with a kisses and hugs and frantic wagging tail.